UBC Assist. Prof. Stephen Berg with school children in Rwanda. UBC Assist. Prof. Stephen Berg, who has seen this time and time again, heads to Rwanda next week where he will introduce playtime inclusion into Rwanda classrooms. 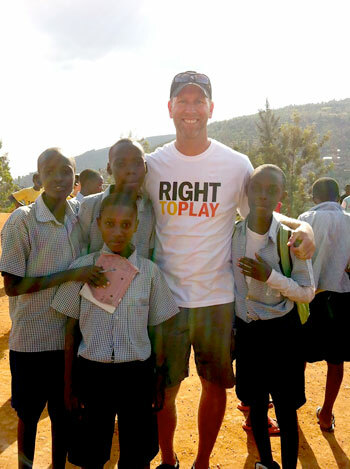 Berg teaches with UBC Okanagan’s Faculty of Education and heads to Rwanda with Right To Play, a global organization committed to using play as a learning tool for children inside and outside the classroom. During his trip, Berg will pilot a program called “Abilities First” that promotes inclusion in the classroom. Right To Play’s use of play as a learning tool appeals to Berg, whose research areas include physical education, health education and children’s physical activity. While in Rwanda, Berg will host a full-day workshop with Right To Play staff and Rwandan school teachers. Feedback from local educators will be incorporated into the training manual in an effort to make the manual more effective in local classrooms. “At Right To Play, we believe play is a powerful learning tool. It engages children’s interest, motivating them to learn inside and outside the classroom. Games, songs, sports, theatre and other types of play help break down social barriers and expand the ways children think and behave with one another,” says Kevin Frey, CEO and president of Right to Play International. Building the capacity of educators to deliver more quality education by using play as a teaching tool is a focus of Right To Play’s "Play for the Advancement of Quality Education" program, undertaken in Rwanda and seven other countries globally, with the financial support of the Government of Canada provided through Global Affairs Canada. Back in 2012, when Berg first visited Rwanda, he saw the technique used to teach children about malaria and how to protect themselves from the infectious disease. Berg has hosted “Play Days” in Kelowna elementary schools. Using Right To Play’s teaching style of Reflect-Connect-Apply, students participate in a fun activity, reflect on what they experienced playing the game, connect their learnings to what they already know, feel and believe and then, apply it to similar situations and aspects of their lives. Berg believes play as a learning tool could be effective in all classrooms.